So there is apparently a rainbow along the top of my admin page here on wordpress. No one asked me if they could put it there. You can customize EVERYTHING… except that rainbow which is not in settings. It is simply THERE because WordPress assumes we want to be “pro-gay” I’m assuming. That or one of the programmers is having Care Bear flashbacks from the 1980s. Anyway, the point is… I’m tired of the “pro gay and proud” mandatory celebration. I don’t want shamrocks on my page without my permission on St. Patrick’s Day. i don’t want Kwanzaa stuff on my page whenever the hell that is. I don’t even want the American Flag on my page without my permission on Flag Day. Yes I’m a vet. No, I don’t think ANYTHING should be posted without my approval. Even the most noble cause is rendered oppressive if it is forced on another. That is the error of Progressivism. it is rooted in the theory that whoever is pushing things on you is BETTER than you and is more able to make your own choices FOR you. Well, I happen to find quite a few things offensive. I find rainbows quite offensive. I find global warming lies offensive (lying in particular is very offensive to me.) I find Islam as practiced in most countries offensive. Folks decry Christianity all the time for being “anti-gay”, but what about Islam? No Christian countries are killing homosexuals to this day. Why are we not offended by the flag of Saudi Arabia or Pakistan for killing homosexuals and minorities in droves? Why is the Islamic “Crescent” not a hate symbol? Why are we told that “Well most Muslims don’t do that?” Well, most rednecks who fly the Battle Flag (look it up) aren’t racist either. They’re not anti-gay. If there’s anything the old Battle Flag stands for, it is freedom. Yes, freedom. They’re not entirely unrelated issues. The two DO have a connection. The Battle Flag is a symbol of states’ rights vs federal power. It is a POLITICAL statement, not racial or cultural so much. Yes slavery was the “straw that broke the camel’s back”, but if you think it’s the ONLY reason for the Civil War, then you need to do some research. The bigger issue was States’ Rights and local governmental control vs a large, centralized national government. If 99% of Southerners didn’t have a slave, you have to wonder what they were fighting for. I don’t own a yacht. I’m not going to go and die in a war for the right of a rich guy to have a yacht. Something had to be in it for the poor white Southerners who gained nothing from Slavery. If anything, they had a reason to OPPOSE slavery because it destroyed the low-skilled labor market. Why hire a poor uneducated white guy if you can get slaves to do the work for FREE? Slavery “took our jobs” so to speak. Read letters from Civil War soldiers sometime. Mostly the Southerners are talking about fighting “to live how we want without others telling us what to do.” The Northerners mostly talk about “punishing the Southerners.” Neither talks about slavery much if at all. So what was the poor white kid in the South fighting for? Freedom. Rights. States’ rights. Individual rights. He was fighting against high taxes imposed on foreign goods. Just as now, the poor lived on lots of cheap, imported goods. Just like a tax on Chinese goods today would screw poor people shopping at Wal Mart and the Dollar Store, so did high taxes on imported goods back then from England and other countries hurt the poor in the South. Those taxes basically FORCED Southern poor folks to buy from Northern factories.. because they had no choice. It’s no coincidence that the Confederate supporters often invoked those names in their “Second War of Independence.” They didn’t fight for slavery. Hell, a LARGE number of Southerners opposed slavery in polls. However, they did fight for CHOICE. They fought for FREEDOM. They fought for people to be able to make the WRONG choice as well as the “correct” one. This is why many Southerners in the North who opposed slavery still went home to “defend their rights.” It wasn’t the right to own slaves. It was the right to have your local voice heard and not imposed from above. it was all about choice. It’s still all about choice. it IS the right thing to take down the Confederate Flag from public buildings. There is no reason for it to be there. The Capitol Building in South Carolina doesn’t represent the Confederacy. For that matter it doesn’t represent only Gay people or Black people or any other sort of people but AMERICANS. So, the only two flags it should have are the US flag (arguably) and the State flag. Similarly, the government shouldn’t be hosting Black History Month, and the President shouldn’t be speaking at the NAACP. Those are specific private groups and causes. We should stick to things that affect EVERYONE equally. I fully support gay rights. However, those are PRIVATE rights not governmental. I reject the assumption that it is the GOVERNMENT that determines if we should or should not have rights to do most anything. The government shouldn’t deny gay marriage. It shouldn’t support gay marriage. It has nothing to DO with “marriage” since that’s a PRIVATE contract between two individuals. Or three or ten… seriously there’s no limit really. Why is polygamy bad? It’s consenting adults marrying one another. Why is gay marriage great but polygamy so evil? Sounds like a MORAL argument to me, not a legal one. And again, the government shouldn’t be involved in MORAL arguments. That’s for individuals and their faith. That this whole hullabaloo is getting out of hand. Stop imposing YOUR morality on other people. It is no more fair to impose YOUR ideas on ME as it is ME to impose my ideas on YOU. Let people marry who they want… in their own church or at their own house… keep the government out of it. Let people fly whatever flag they want from their own property. Fair is fair. Choice is choice… even when it’s not the choice YOU would make. That’s what is beautiful about America, and that’s what we’re losing… the right to choose. How ironic that “pro choice” is proclaimed the loudest by the same people who oppose choice in so many areas of our lives. “Pro-choice” in abortion, but “anti-choice” in everything else it seems. On the bright side, at least on the Confederate Flag side of the house things seem to be mostly free. 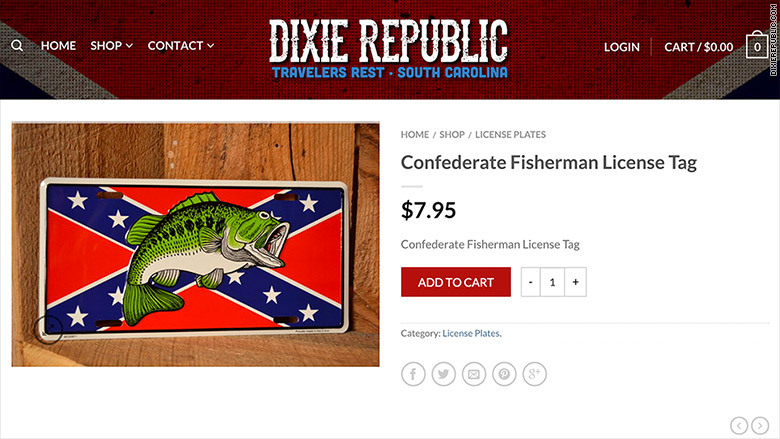 While I disagree that the Governor of South Carolina can unilaterally rule on the flag (I think it should come to a vote first), it is encouraging to see that the “bans” seem to be commercial. Hey, Amazon and Apple can decide to sell or not to sell whatever they want. That’s their right. I also have the right to NOT buy things from them. As long as there are people out there willing to sell those items, they will LOSE that money. However, others are more than willing to take up the slack. We seem to jump from one band wagon to another. I would rather walk along with many others!